Openness and expectancy abounded throughout the CARE Seminar that opened the convention of the Hispanic Council (Concilio Hispano) of the Church of God in Houston, Texas, near the end of July. Pastors and spouses gathered and processed together for the three-and-a-half hour dialogue regarding pastoral compensation and financial planning. 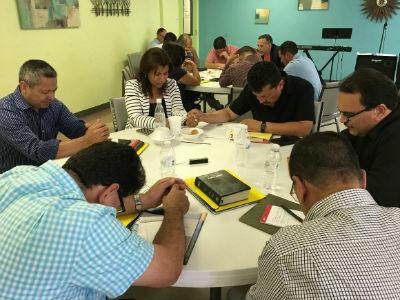 Again and again, participants expressed their gratitude for the intentional reach into the world of Spanish-speaking congregations of the Church of God. Presentations were led by Ryan Harter and Wayne Bollenbacher of Servant Solutions, and Joseph Cookston, the CARE Initiative director from Church of God Ministries. Jose Pagan served as the Seminar translator, and six facilitators guided round table feed back and listened with compassion—Mary Ann Martinez, Marcos Garcia, Tony Seijo, Gorge Palacios, Raphael Bermudez, and Joselyn Seijo. All officers of the Hispanic Council participated in the discussions throughout the afternoon. Taking into account the particularities of the Hispanic culture regarding pastoral compensation. Effective pastoral care in Hispanic congregations. More financial planning material in Spanish. More support for younger Hispanic pastors. Pastor Antonio and Joselyn Seijo of Puerto Rico won the $200 Hilton Honors gift card. Three pastors were blessed with $25 gift cards to Starbucks and Amazon. Registration for the entire convention was complimentary for all attendees. Great cheers erupted from the participants expressing the depth of their gratitude. The next CARE presentation will be with students Center for Christian Ministry, Anderson University, both graduate and undergraduate. In 2018, the CARE Seminar will be hosted during the Tuesday daytime preceding each of the five Regional Conventions. This entry was posted in All Church of God, Central, Church of God Ministries and tagged CARE, Clergy Advocacy Resource Effort, Concilio Hispano, convention, Hispanic Council, Houston, Joseph Cookston, pastoral compensation, Spanish-speaking, Texas, TX. Bookmark the permalink.